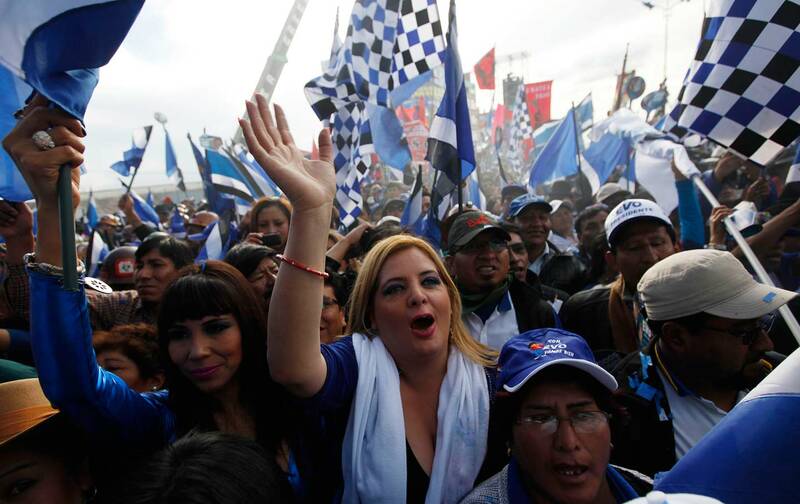 Has the Left Run Its Course in Latin America? Hardly. Despite recent setbacks, it has led the region’s “second independence,” benefiting hundreds of millions. There is a popular narrative here in Washington and media circles that Latin America’s left-populist turn has finally run its course. It goes something like this: A commodities boom, led by demand from China for Latin American raw materials exports, fueled regional economic growth in the 2000s. This happened to coincide with the election of left governments that were reelected after spending lavishly on handouts to the poor. They alienated foreign investors and their economic policies were unsustainable. Now Chinese growth has slowed, commodity prices have gone south, and with them the fortunes of Latin America’s nationalist, populist left. November’s election of right-wing challenger Mauricio Macri as president of Argentina, the Venezuelan opposition’s landslide congressional win in December, and economic and political crisis in Brazil—including the current effort to remove President Dilma Rousseff—herald the beginning of the end of an era. In this view, the region will continue to elect more right-wing—or, in business-press parlance, “moderate” (and pro-US)—governments that will return to some of the more sensible economic policies of their predecessors. Is this true? The short answer is no. It is true that Latin America has been affected by the ups and downs of the global economy: The regional economy was basically flat in 2015, and is projected to shrink by 0.5 percent this year. But this is not the main story. To understand what has happened in the 21st century, we must first try to grasp why the left won so many elections that it went from governing no one to governing a majority of the region in less than a decade. The main cause of the “pink tide” was a long-term economic policy failure, not seen for at least a century in the region, in the last two decades of the 20th century. Regional real income per person grew by just 5.7 percent from 1980 to 2000, as compared with more than 90 percent in the previous two decades. Is This the End of the Latin American Left? The region’s long-term growth failure was also a period in which Washington exercised a strong influence over economic policy. As late as 2002, when Luiz Inácio Lula da Silva of Brazil’s Workers’ Party was running for president, the International Monetary Fund sat down with him and his opponents to decide what the post-election macroeconomic policy would be for the next couple of years, regardless of who would win the election. But despite being held back at the starting gate, Brazil was able to triple its economic growth per person as compared to the prior government; and reduce poverty by 55 percent, and extreme poverty by 65 percent, by 2014. The real minimum wage was doubled, unemployment hit a record low of 4.8 percent in 2014, and real wages grew substantially for the first time in years. After Evo Morales renationalized Bolivia’s hydrocarbons industry, government intake increased sevenfold over eight years. Bolivia was operating under IMF agreements for nearly 20 consecutive years, until its first indigenous president (in a majority indigenous country), Evo Morales, was elected and took office in 2006. At the time, the country’s per-capita income was less than it had been 27 years earlier. One of the government’s first moves was to renationalize the hydrocarbons industry, which—even more than price increases—helped boost the government’s take nearly sevenfold, from $731 million to $5 billion, over the next eight years. This move, which was impossible when the government did not have economic sovereignty, was the foundation for the remarkable economic and social progress of the past decade. Politically, the government had to overcome a violent right-wing secessionist movement. It kicked the US ambassador out of the country in 2008, with President Morales accusing him of aiding the violent opposition. At that time, the US State Department was pouring large amounts of money into Bolivia and refusing to disclose where it was going (the United States and Bolivia still do not have ambassadorial relations today). But once stability was achieved in 2009, the economy did very well even during the world recession, boosted by a large increase in public investment. Changes in economic policy were also key to Argentina’s success after its default and devaluation at the end of 2001. The remarkable economic growth and poverty reduction that followed over the ensuing decade—real GDP increased by about 78 percent, and poverty was reduced by more than 70 percent (these numbers are based on independent estimates, as the government’s estimates of inflation are disputed; see http://sedlac.econo.unlp.edu.ar/eng/statistics.php)—had relatively little to do with commodities. It was not even export-led growth. One necessary condition for Argentina’s robust recovery (real GDP grew by more than 60 percent from 2002 to 2008) was the government’s default on the foreign debt and its taking a hard line in the renegotiation. Right away, this achieved a sustainable debt burden—rather than getting Argentina stuck in a series of recurring crises due to too much debt, as with Greece, for example. And again in contrast to Greece, Argentina freed itself from the demands of its creditors for continuing austerity. The government was also able to tax exporters to capture the windfall from the devaluation, use the central bank to manage the exchange rate, implement a financial-transactions tax, and pursue other policies that enabled the country to emerge from depression. From 2002 to 2013, the regional poverty rate fell from 44 to 28 percent—after rising over the previous two decades. Where revenue from commodities helped, in Argentina and elsewhere, was not in driving growth itself but in allowing these countries to avoid balance-of-payments problems as they grew more rapidly. When an economy picks up steam, demand for imports tends to grow faster than exports, and so there is a risk of running short of hard-currency international reserves. So in countries that were vulnerable to these problems—Argentina, because it could not borrow internationally, and Venezuela, because of a dysfunctional exchange-rate system and its dependence on oil revenue—the commodities bust was damaging. But overall in the region, during the upswing Latin America’s economic and social progress in the 21st century was driven by economic-policy changes: counter-cyclical changes in fiscal and monetary policy, increased public investment, increases in minimum wages, public pensions, healthcare, and conditional cash-transfer programs for the poor. From 2002 to 2013, the regional poverty rate fell from 44 to 28 percent—after actually rising over the previous two decades. Just as positive policy changes, many enabled by Latin America’s “second independence,” were behind the region’s big rebound in the 21st century, much of the current slump is driven by policy mistakes. Beginning at the end of 2010, with some interruptions, and then doubling down after Dilma Rousseff was reelected at the end of 2014, Brazil’s PT government began to implement a series of policies that pushed Latin America’s largest economy into a deep recession. These included large cuts in public investment, budget tightening at the wrong times, two cycles of interest-rate increases, and credit tightening. The saddest part about Brazil’s austerity is that it was so unnecessary: The country still has more than $350 billion in reserves, and therefore could stimulate its economy without any worries about running into balance-of-payments crises. Dilma’s political opponents have taken advantage of the recession, and of the Brazilian media’s all-out war against the government, to launch what she has labeled a “coup” against her. She has a strong case: Unlike most of the members of Congress leading the impeachment, she is not charged with any corruption, but rather with an accounting abuse that previous presidents engaged in, which is hardly an impeachable offense. Each country has a different story in the downturn: Ecuador’s current recession is largely due to the collapse in the price of oil, which accounts for the majority of the government’s revenue. Venezuela has of course also been hit hard by the oil-price collapse, but its recession began when oil was still at $98 a barrel. In its case, the economy got caught in an “inflation-depreciation” spiral, which brought inflation to 180 percent last year, while the black-market rate for the dollar rose to more than 100 times the official rate. As in Brazil, this was mainly a result of policy mistakes; most importantly in Venezuela, the unsustainable effort to maintain a fixed, overvalued exchange rate. But don’t expect the current downturn in the region to repeat the lost decades of the late 20th century. That kind of long-term disaster generally happens when countries do not have sovereign control over their most important economic policies (as in the troubled eurozone countries today). For the past 15 years, Washington has sought to get rid of Latin America’s left governments; but its efforts have really succeeded, so far, only in the poorest and weakest countries: Haiti (2004 and 2011), Honduras (2009), and Paraguay (2012). The Latin American left has led the region’s “second independence” in the 21st century, altering hemispheric economic and political relations, and—even including the economic losses of the recent downturn—presiding over historic economic and social changes that benefited hundreds of millions, especially the poor. Despite the electoral setback in Argentina and the current threat to democracy in Brazil, they are likely to remain the dominant force in the region for a long time to come. Mark WeisbrotMark Weisbrot is co-director of the Center for Economic and Policy Research in Washington, DC, and president of Just Foreign Policy. His latest book is Failed: What the "Experts" Got Wrong About the Global Economy (2015, Oxford University Press).